We have our waterfowl / upland bird hunters fly into Regina, Saskatchewan. From there we are just a short 1 ½ hour drive to camp. During your stay, we have very nice, comfortable farmhouse lodging for our hunters with home cooked meals all included. At the lodge we have satellite TV, tables for playing cards and additional evening activities after dinner. In addition to the lodging and meals we also include bird cleaning and guided services in all of our guided Saskatchewan bird hunts. A typical day for our combo hunters can mean just about anything. 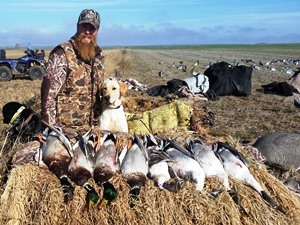 We offer World Class snow goose hunting, Canada goose hunting and duck hunting for the waterfowl hunting side of the hunt. Then we offer World Class Hungarian partridge hunting and sharptail grouse hunting for the upland end of the hunt. 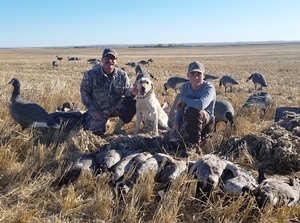 We can mix and match a half day of each or spend a day or two after one or the other and switch up our game plan for the second half of your Saskatchewan bird hunting trip. We can meet any length of stay or group size. THIS IS YOUR HUNT! The country is absolutely beautiful and if you have big running pointers or close working flushers, you will have a blast on your upland hunt. 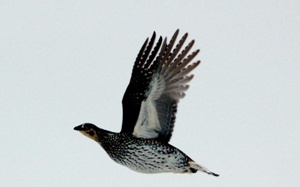 You will truly be amazed at the caliber of the upland bird hunting in our area. The waterfowl hunting goes without saying in this region during the migration. We are also able to set up late season hunts as well for those die hard hunters. 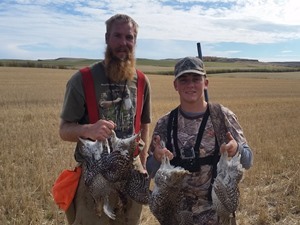 Please browse through our Saskatchewan Waterfowl Hunting section and our Saskatchewan Upland Bird Hunting Section to get a better idea of what your options are and then give Saskatchewan bird hunting outfitter Kyle Hauck a call to discuss your specific wants and needs. We have purposely left off our pricing due to the fact that we do not want to limit our hunters by the cost of the hunt. In fact we are able to tailor your hunt to most every specific budget and need. Please contact Saskatchewan bird hunting outfitter Kyle Hauck today at 605-210-3727 to set up an appointment to discuss your desires and needs and we will build a waterfowl / upland combo hunt specifically for you!